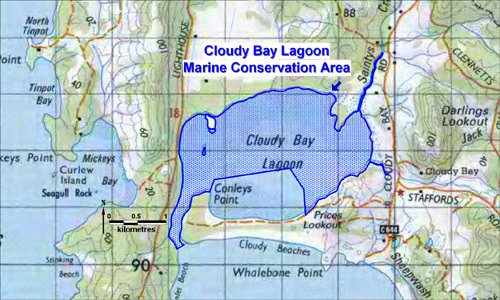 The Cloudy Bay Lagoon Marine Conservation Area is located within Cloudy Bay Lagoon in the south of Bruny Island. The reserve occupies 480.1 hectares and incorporates the Cloudy Bay Lagoon inlet system which contains seagrass and shallow sediment microalgae, a highly productive environment. The inlet is of high conservation value and is considered to be the most pristine marine inlet in the Bruny Bioregion.